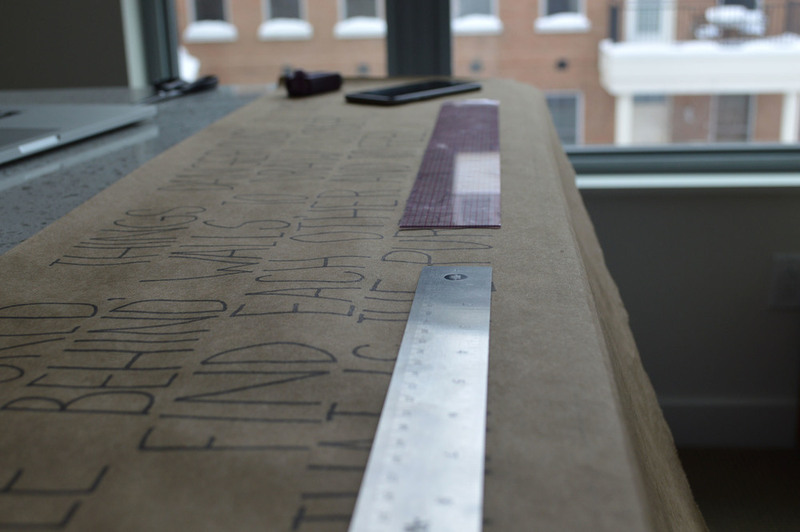 KRAFT PAPER AND A GOOD QUALITY QUOTE: THESE ARE A FEW OF MY FAVORITE THINGS. BUT REALLY, BUY ME A ROLL OF KRAFT PAPER AND I'LL BE INDEBTED TO YOU FOREVER. I'VE RECENTLY MOVED AND AM UNDERGOING CERTAIN PROJECTS FOR EACH ROOM. GOING FROM A STUDIO TO A TWO BEDROOM APARTMENT, YOU COULD SAY WE HAVE ACQUIRED A BIT MORE WALL SPACE, THEREFORE MY BRAIN IS ON OVERDRIVE CREATIVELY COMING UP WITH NEW DECOR. THIS ONE IS SIMPLE, YET EXACTLY WHAT I HAD IN MIND. HERE IS THE LOW DOWN ON HOW I CREATED OUR SUPER SIMPLE KITCHEN ART. ONE OF MY FAVORITE QUOTES IS FROM THE FILM THE SECRET LIFE OF WALTER MITTY. IT GOES, "TO SEE THE WORLD, THINGS DANGEROUS TO COME TO, TO SEE BEHIND WALLS, TO DRAW CLOSER, TO FIND EACH OTHER AND TO FEEL. THAT IS THE PURPOSE OF LIFE." I DECIDED TO CREATE A BANNER THAT WOULD OVERLOOK OUR KITCHEN/LIVING SPACE. ONE THING NECESSARY WHEN WORKING ON ANY FREE HAND WRITING IS LINES. MAPPING OUT WHERE AND HOW LARGE YOU WANT THE TEXT TO BE MAKES IT SO MUCH EASIER TO ACCOMPLISH A COHESIVE AND NEAT PEICE. THERE'S NOTHING WORSE THAN THE INEVITABLE TILT LIKE WHEN WRITING ON A CHALKBOARD. ONE OTHER IMPORTANT DETAIL IS TAPE. BE SURE TO ANCOR DOWN YOUR PEICE TO YOUR DESIGNATED WORKSPACE. HAVING THE INSPIRATION PRESENT WHILE WORKING ON YOUR PROJECT IS KEY. IF THERE IS A FONT YOU WANT TO EMULATE, HAVE IT VISIBLE TO YOU WHILE YOU WORK. I WANTED THE BANNER TO BE CLEAN AND SIMPLE. I WENT WITH A MODERN FONT AND KEPT IT AS TRUE TO THE ORIGINAL AS I COULD. I OUTLINED THE PENCIL I HAD PREVIOUSLY DRAWN WITH A PRISMACOLOR FELT TIP MARKER. I ERASED ANY PENCIL MARKS LEFT OVER. I PREPARED TO CUT AWAY THE EXCESS PAPER AND TRIMMED ALONG THE LINES I MAPPED OUT IN THE BEGINNING. COMMAND STRIPS SAVE LIVES, I MEAN IT. THEY'RE SUPER SIMPLE TO APPLY AND REMOVE. FOR THIS, I ADDED ONE TO EACH CORNER AND TWO AT THE TOP AND BOTTOM OF THE CENTER. 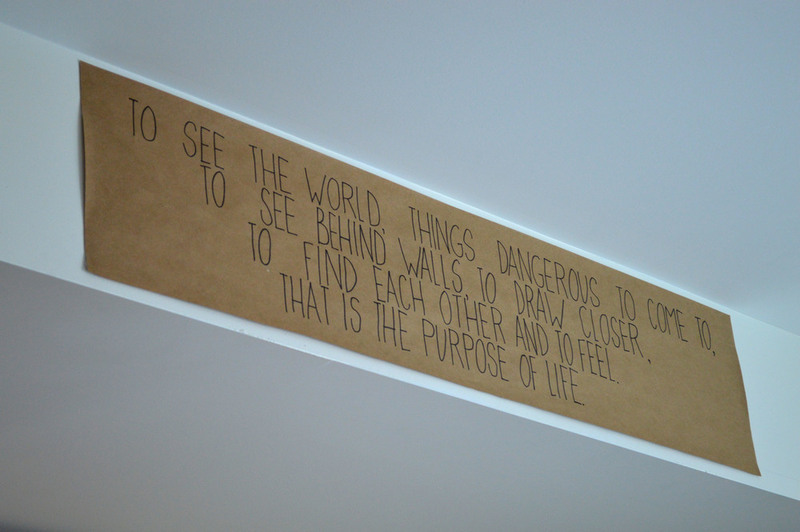 IT NOW HANGS ABOVE THE KITCHEN OVERLOOKING OUR LIVING SPACE, REMINDING US DAILY THE PURPOSE OF LIFE.